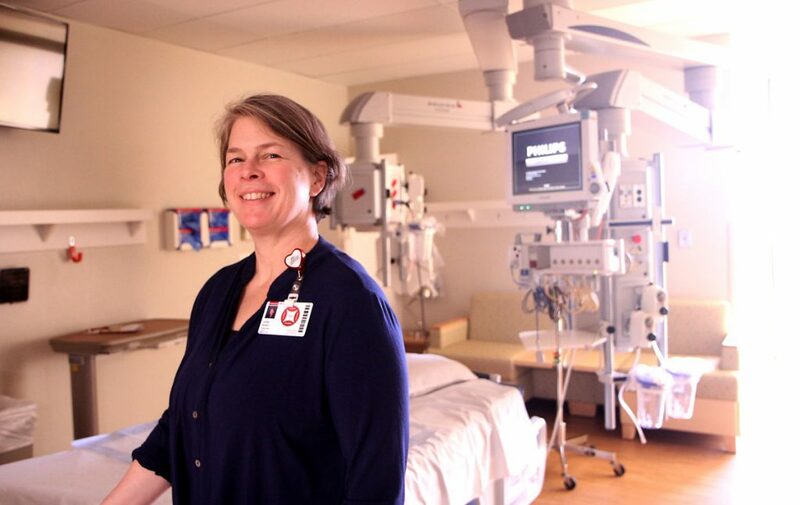 A UCHealth nurse’s quiet confidence helps in the ICU and in the skies. Captain Lydia Baldwin in the cockpit, ready for takeoff. Photo by Andrew Kensley, for UCHealth. On a brisk, cloudless November morning at Northern Colorado Regional Airport in Loveland, airplane captain Lydia Baldwin muscles open the dented aluminum hangar doors. Baldwin enlists the help of her passenger to manually tow the plane out. She walks around the single-engine Piper Cherokee that looks in surprisingly good shape for a 46-year-old model. “Still got a lot of life in her,” she says with a chuckle. She runs her hand along the flaps, ailerons and tail for any abnormalities, deliberately and with a measure of compassion. Once inside the snug cockpit, she perspicaciously reviews a checklist, item by item, in what sounds like a foreign dialect. After a short taxi to runway 3-3, Cherokee 1-5-6-Niner-5 alights into the airspace above “NoCo Regional.” At that moment it becomes clear that the qualities that make Baldwin a competent pilot are the very same that help this registered nurse steer UCHealth Poudre Valley Hospital’s Intensive Care Unit through the turbulence of critical care. Whether improving lives or flying to visit her mother in New Mexico, Baldwin understands the importance of processes. Lydia Baldwin, UCHealth ICU manager. Photo by Kati Blocker, UCHealth. Baldwin has been a practicing nurse for 19 years, most of which were spent tending to critically ill patients in the ICU. As a manager for 10 years, her leadership style is well-received by her employees and peers. 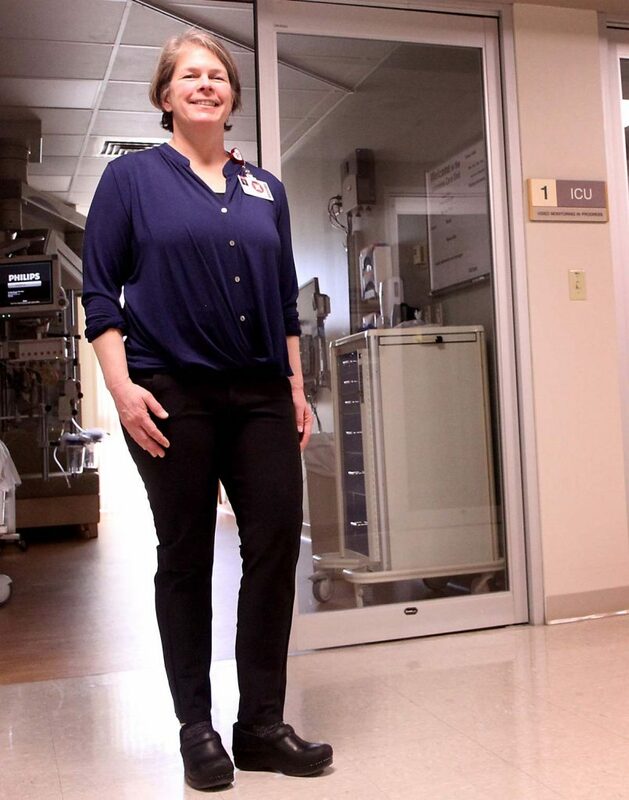 “Lydia works hard to make sure we’re not only satisfied at work but that we take care of ourselves as well,” says Megan Tschacher, an ICU nurse who has worked under Baldwin for a decade. Critical care nursing and flying planes demand an ability to perform numerous simultaneous tasks while staying calm in stressful situations. The 50-year-old Baldwin is able to compartmentalize those challenges with self-confidence — and by trusting those around her. Baldwin constantly scans for everything from storm clouds to dangerous heart rhythms that lurk over the horizon, and asks, “What do we need to do about that?” And yet, gliding over the unbounded atmosphere provides a sense of calm, as well as perspective on managing people and situations that often are out of her control. Tschacher, who has also flown with her boss, sees on a daily basis Baldwin’s quiet confidence evince itself in productive ways. Luckily, the 45-minute aerial tour of Northern Colorado goes as smoothly as a dose of medication running through an IV line. Humming along at 85 knots (around 97 mph) and 2,000 feet above terra firma in a cockpit the approximate size of a bathtub, Baldwin holds the yoke gently as she banks toward A-Mountain. She points out all the vital signs of the regional landscape: Colorado State University’s football stadium, PVH and UCHealth Medical Center of the Rockies, the drive-in movie theater, Fort Collins City Park, and Pikes Peak in the distance. “Being off the ground in a machine is magical and awe-inspiring,” says the captain. Lydia Baldwin and her Piper Cherokee 1-5-6-Niner-5 at outside her hanger at Northern Colorado Regional Airport. Photo by Andrew Kensley, for UCHealth. 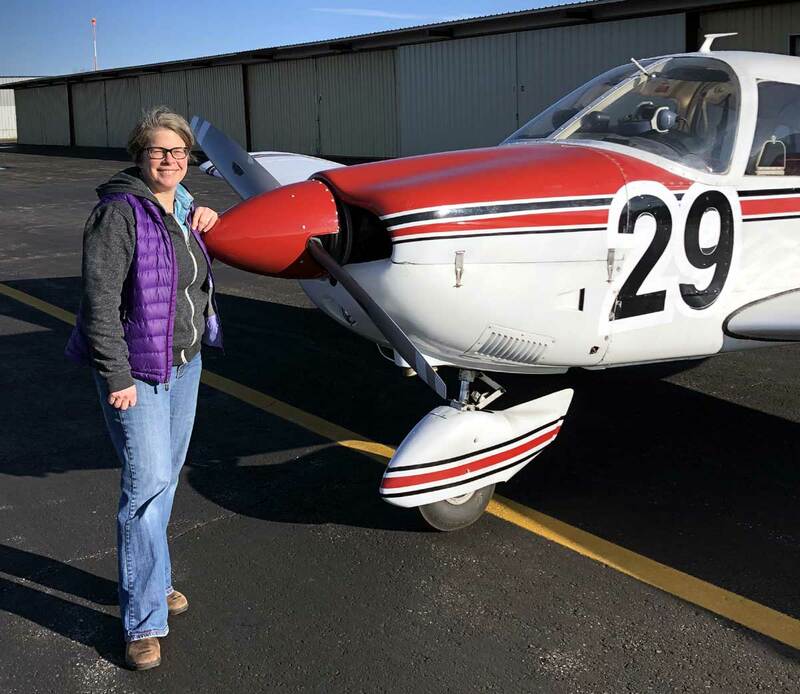 Inspired by her nearly 80-year-old mother, who became certified to fly at the age of 60, Baldwin flies for pleasure around northern Colorado, with regional trips to Steamboat Springs and to visit her family. 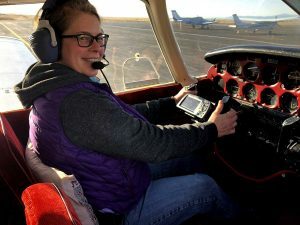 But her biggest enjoyment comes from competing in air races with a cohort of other female pilots from around the country, including her mother. “About 20 years ago I went to see my family at the start of the Air Race Classic in Bozeman, Montana, and I thought, ‘Look at all these cool women getting together and doing this amazing adventure.’ I want to do that,” she says excitedly. Within a year she earned her pilot’s license. While Baldwin admits she’s no adrenaline junkie, both flying and caring for patients still give her enough of a thrill. She likes the challenge of learning “how and what” and constantly seeks out ways to do better. Andrew Kensley is a Colorado freelance writer, published author and physical therapist for UCHealth Poudre Valley Hospital in Fort Collins.